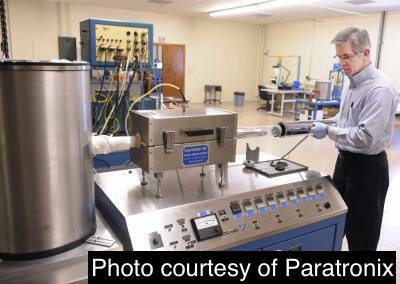 The Parylene conformal coating process is a specialised vapour deposition application technique. This offers unique material properties that give a lot of unique advantages compared to other conformal coatings. Parylene coatings are completely conformal to the surface of the Printed Circuit Board (PCB) or product. This means that the coating has a uniform thickness and is pinhole free. As a result, component configurations with sharp edges, points, flat surfaces, crevices or exposed internal surfaces are coated uniformly without voids. Parylene coating provides an excellent barrier that exhibits a very low permeability to moisture and gases. This means that products coating in parylene generally are more “waterproof” than the same products coated in a liquid conformal coating. Parylene is unaffected by solvents, has low bulk permeability and is hydrophobic. Coatings easily pass a 100hr salt-spray test. Parylene has excellent electrical properties. These include low dielectric constant and loss with good high-frequency properties, good dielectric strength, and high bulk and surface resistance. Parylene is transparent and can be used to coat optical elements. No initiators or catalysts are involved in the polymerization so the coating is very pure and free from trace ionic impurities. Room temperature formation means the conformal coating and the parts are effectively stress-free. Parylene has good thermal endurance. Parylene C performs in air without significant loss of physical properties for 10 years at 80°C and in the absence of oxygen to temperatures in excess of 200°C. FDA approval of parylene-coated devices is well-documented. The coatings comply with USP Class VI Plastics requirements and are MIL-I-46058C / IPC-CC-830B listed. Why is Parylene Coating Used?